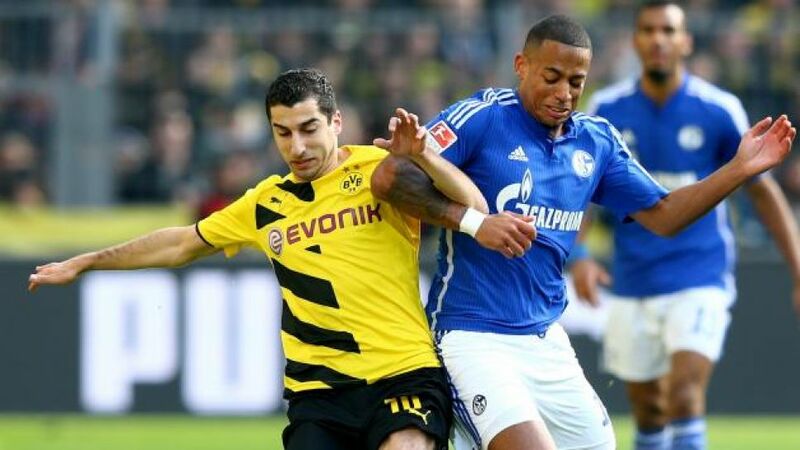 Borussia Dortmund and Henrikh Mkhitaryan (l.) go head-to-head with Revierderby rivals Schalke 04 on Sunday. All eyes will be on the SIGNAL IDUNA PARK on Sunday as Borussia Dortmund and FC Schalke 04 lock horns for the 87th edition of the Revierderby. bundesliga.com has all the build-up to Sunday's eagerly-anticipated clash between the two Ruhr rivals, as well as reaction to the weekend's other fixtures. That's all from Matchday 12. The Bundesliga stars now head into the international break, but stay with bundesliga.com for all the latest from the German top flight. Holger Badstuber was a happy man indeed after making his first appearance in exactly 200 days as a second-half substitute in FC Bayern München's 4-0 drubbing of VfB Stuttgart. "I'm raring to go and am feeling good, but I know there's still something missing after just two weeks of training," he said after the game. "I've got my first appearance behind me and now it's about moving forward." Don't forget, you can tune into today's games live on Bundesliga radio. Just follow this link. Bremen have won twice on the road the season, both by a final scoreline of 3-1. Victory at rock-bottom Augsburg this evening would take the Green-Whites up to 14th, five points clear of the automatic relegation places. Die Fuggerstädter, meanwhile, cannot rise any higher than 17th. It's the day all Borussia Dortmund and FC Schalke 04 fans have been waiting for. We'll be bringing you all the build-up to the 87th Bundesliga Revierderby - as well as SV Werder Bremen's trip to FC Augsburg - and, of course, all the reaction to the rest of the weekend's action. We'll be back on Sunday, folks. Don't forget to join us then as we count down to the 'Mother of all Derbies', which kicks off at 15:30CET/14:30GMT. Bye for now! Hamburger SV surrendered a one-goal lead at promoted SV Darmstadt in the evening game. The result nevertheless keeps Bruno Labbadia's HSV a point and two places above the 13th-placed Lilies in the mid-Matchday 12 standings. There was more in it today for us! Shame - we still have to be happy with the point. "Finally another home win," reads this tweet after 1. FSV Mainz 05 saw off last season's runners-up VfL Wolfsburg at the Coface Arena. It was the 05ers' first win on home soil since Matchday 5. "We expect the atmosphere tomorrow to be more heated and more electric than usual. We have to stay cool." "We'll really miss Marco Reus, but we're ready to play without him." "The coaching team approach the derby like they do any other game. It's important not to let emotions take over." "Schalke will put everything into it, they'll be really up for it. We have to focus on our strengths." "We're well-equipped. Now all that matters is that we bring it on the pitch on Sunday." Impressive footage there from the Royal Blues' training ground, some 3,000 fans gathering to show their support ahead of tomorrow's Revierderby away to Borussia Dortmund. Click here to learn all about one of world football's fiercest rivalries. Bayern quartet Philipp Lahm, Holger Badstuber, Joshua Kimmich and Sven Ulreich are up against former side Stuttgart at the Allianz Arena this afternoon. Kick-off in Munich is at 15:30CET/14:30GMT. Schalke 04 head coach Andre Breitenreiter can hardly wait for his first Revierderby experience to kick off, the former SC Paderborn tactician admitted at today's pre-match press conference ahead of Sunday's clash with bitter rivals Dortmund. Hello and welcome to another day of live bulletins from Germany's top division, including press conferences with Thomas Tuchel and Andre Breitenreiter ahead the much-anticipated Revierderby between Borussia Dortmund and Schalke 04! ...just do not want to go home! The Hertha Berlin fans have been rewarded for sticking around, as the team came out again to celebrate a 3-1 win in Hanover with them. Salomon Kalou has a job on his hand getting away from Hanover tonight, but he won't mind all the post-match interviews after his hat-trick. Some reaction from Hertha players, including Valentin Stocker saying it was the "perfect answer" to the defeat to Gladbach, and Per Skjelbred praising the three-goal hero Salomon Kalou. It's almost time for kick-off, so why not head over to Twitter to follow tonight's Matchday 12 opener? Alternatively, you can listen to all the action live on Bundesliga radio from 20:30CET/19:30GMT. 1. FC Köln coach Peter Stöger knows his team face "a very tough task" when they make the short trip to face Rhine rivals Bayer 04 Leverkusen on Saturday (kick-off 15:30CET/14:30GMT). "The players don't need any extra motivation, they know each game is important." Köln are expecting 6,500 fans to back them at the BayArena. Though he had words of praise for Holger Badstuber (see below), Pep Guardiola believes it is still too early for the Germany international to complete his comeback from the thigh injury that has sidelined him since Matchday 29 last season. "He's still not an option for the starting XI," the Bayern told media. Borussia Dortmund, meanwhile, have been dealt a major blow with Marco Reus ruled out of Sunday's Revierderby with Schalke 04 due to an adductor injury. The Germany international was taken off at half-time after having scored in Dortmund's 4-0 Europa League victory over Qäbälä FK on Thursday, and further medical examination of the problem means Reus will be sidelined for two weeks. The Revierderby is not the only fierce regional rivalry being played out this weekend. Bayer 04 Leverkusen face Rhine rivals 1. FC Köln, but they will have to do so without Lars Bender, who has an ankle injury, as coach Roger Schmidt told the press on Friday.